The Spring edition ofÂ BMW Motorcycle Magazine has been mailed to subscribers and you should be able to pick up a copy on newsstands within the next couple of weeks. 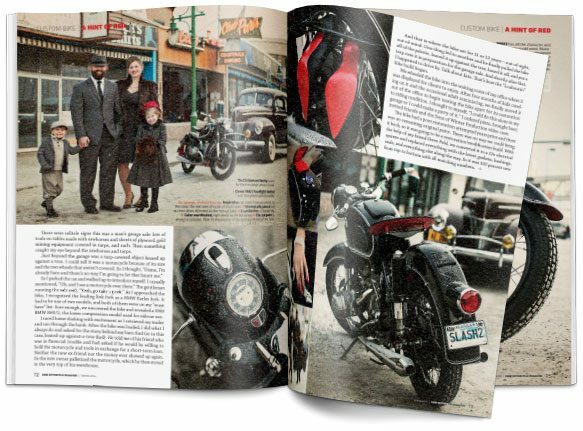 Be sure to check out the feature article, “A Hint of Red,” which tells the tale of Erik Christensen and friends rebuilding a vintage 1968 BMW R60/2 motorcycle. Morr Art’s layout really sings here because of the fabulous photography by Relic Photographic. The “look” is due, in so small part, to the efforts of the entire Christensen family who set up the photo shoot, with vintage clothing, hair styles and cars, in the middle of an Alaskan winter. I don’t know how they convinced auto enthusiasts to bring their cars out in the snow, but the results were worth it.